KENNEWICK, Wash. (AP) - Jaymi Trimble's fascination with Bigfoot began when she watched the famous Patterson-Gimlin film at the Princess Theatre in downtown Prosser. She was 11, and became "totally intrigued," she said. She still is. Trimble, now 49, is starting a group in the Tri-Cities for people who want to read about, research and track the mysterious creature, also called Sasquatch. The first meeting of her Northwest Bigfoot group is 1 p.m. Sunday at the Mid-Columbia Libraries' branch at 1620 Union St., Kennewick. Bill Laughery, a former game warden and Bigfoot tracker whom Trimble calls a mentor, is scheduled to appear. "I know that there's interest in our community. I thought this would be a great way for people to get together, share ideas and go out (on treks)," Trimble said. She has read dozens of books on Bigfoot and spent hundreds of hours researching in the field. She said she's found tracks in the Blue Mountains, making casts of two of them, each 16 to 18 inches long. She said she alsohas heard vocalizations - "a very unusual, distinctive sound" she describes as a combination of a horse cough and braying. But if the species really exists, roaming the wilderness, how has it stayed hidden so long? Trimble has heard that question before. Think about the panda, she said; so familiar now, the black-and-white bear wasn't widely known until the last century. Also, she said, myths don't leave behind footprints. "Myths do not leave behind DNA." She points to the work of Melba Ketchum, a Texas scientist who says a five-year DNA study proves a "novel hominin hybrid species," or Bigfoot, exists in North America. Trimble, a mother of three, lives in rural Benton County. She has a master's degree in history and was working as a writer when she was hit by a car while riding her bike almost four years ago, she said. She was seriously hurt, with head and bodily injuries, and sought refuge in the Blue Mountains as she recovered, she said. Her time in the mountains helped her rebuild self-confidence and reignited an interest in Bigfoot that was sparked when she was a girl. "The first summer out, I found my first track. It (was) like, what is this?" she said. "It just went from there." Trimble also runs a summertime Bigfoot Boot Camp in the Blue Mountains for families. The Northwest Bigfoot group will meet monthly. I would love to be there but live to darn far away. Are you still having the meetings? I'm interested in attending them. 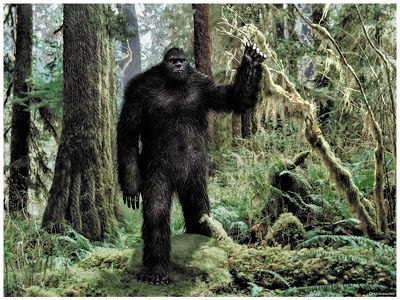 I've been intrigued by the big guy after my sighting when I was 11 years old, back in 1967.